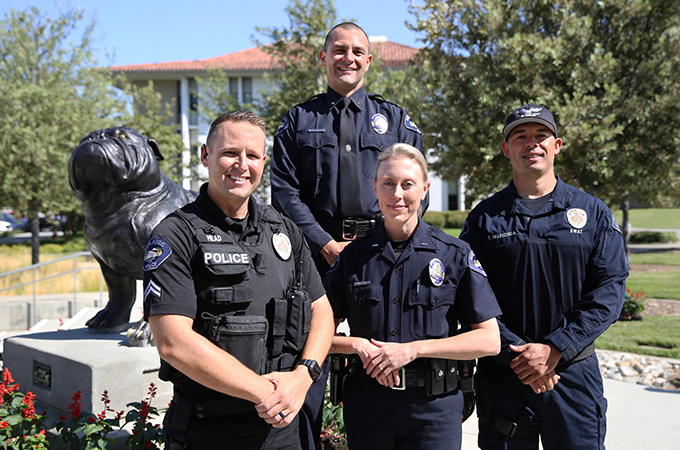 Martinez, who was promoted from lieutenant to commander, says he first became interested in working for the police department 23 years ago thanks to a connection with a Pi Chi fraternity brother who was a police captain. “He convinced me to do a couple ride alongs with him, and then I became an intern for the Redlands Police Department,” says Martinez. During those 20 years, Tolber has worked patrol and served as a field-training officer, a special victim’s detective, and the Professional Standards Sergeant, receiving civic recognitions and honors for her leadership, work, and service. She notes that her time at the U of R fostered a deep commitment to service within the Redlands community. Mead, adopts a similar approach in working with the Redlands community. Mead’s promotion to corporal/detective will require him to work on open investigations, using skills he developed at the U of R.